Distribution: The Swainson’s hawk is a migratory species that breeds primarily in open habitats in the Great Basin and eastern prairies of Canada and the United States and in California’s Central Valley. Swainson’s hawks migrate great distances to the fertile, lowland plains of Argentina in the winter, with smaller numbers wintering in Mexico, Central America, and Columbia. A few birds have been documented wintering in the Sacramento”“San Joaquin River Delta. In California, the Swainson’s hawk breeds in the Central Valley, Modoc Plateau, Owens Valley, and the Antelope Valley. The majority of Central Valley nest sites are found in Sacramento, Yolo, and San Joaquin Counties. In the Natomas Basin, Swainson’s hawks nest primarily in the riparian areas along the Sacramento and American Rivers and along the Natomas Cross Canal. 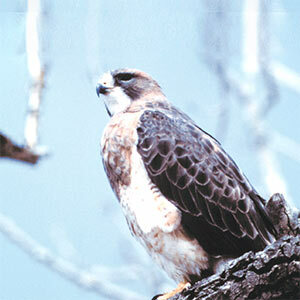 Habitat Requirements: The Swainson’s hawk is a raptor of open landscapes. It forages in native grassland, shrubsteppe habitats, and agricultural fields. During the nesting season, it also requires access to mature trees. 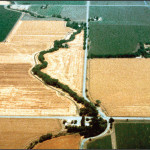 In the Central Valley, Swainson’s hawk nest sites are associated with riparian areas because of the large cottonwoods, willows, oaks, and sycamores that such habitats provide. 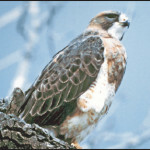 The Swainson’s hawk is also known to nest in isolated trees in fields, in wind breaks, and occasionally in mature trees in residential or suburban areas. Reproduction and Demography: Swainson’s hawks generally start courting and nest building as soon as they arrive from their wintering grounds. 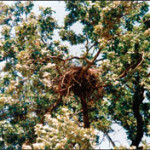 The hawks build small- to medium-sized platform nests of sticks and fresh greenery, usually high in large trees where they will have sweeping views of the surrounding terrain. 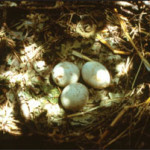 One to four eggs are laid, and the clutch is incubated by the female for approximately 35 days. 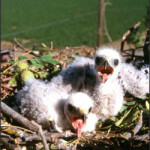 Young remain in the nest for up to 33 days before making exploratory climbs to nearby branches. The first flight occurs at about 38″“46 days. Movement: Swainson’s hawks start to arrive in California in February to March and leave for southern wintering grounds from September to October. They have large home ranges, sometimes foraging almost 20 miles (32 kilometers) from their nest sites. 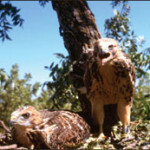 Juvenile hawks may disperse in late July to August and gather into small foraging groups. Adults leave about one month or more after the young, and they may gather into large groups prior to migrating. Ecological Relationships: Swainson’s hawks have adapted well to certain agricultural practices. They have been known to follow farm equipment, hunting for the rodents that are unearthed by the machinery, and to flock to recently tilled or flooded lands. This video is approximately 3 MB in size. It requires QuickTime to be installed on your computer to view it. Download QuickTime for free. 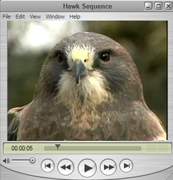 Download and view the Swainson’s Hawk movie. This is a February 2009 study detailing preferences for ground cover and vegetation for the Swainson’s hawk. The official title is, “The Influence of Vegetation Structure on Swainson’s Hawk (Buteo swainsoni) Foraging Habitat Suitability in Yolo County, California,” by Estep Environmental Consulting.